Amora, whose epoch is uncertain; known chiefly on account of a controversy which he had with a certain Philippus (or a philosopher). The latter remarked: "Does not the prophet say concerning Edom (Mal. i. 4), 'They shall build, but I will throw down'? And yet, behold, whatever they builded still stands!" Thereupon El'asah said: "Scripture does not mean material building, but machinations. As much as ye plan and devise against us, to upbuild yourselves and to destroy us, the Holy One—blessed be He!—annihilates it all." "As thou livest," then admitted the first, "so it really is. We often make attempts to destroy you, but some elder appears and prevents our accomplishing anything" (Midr. Teh. ix. 7; Yalḳ., Mal. 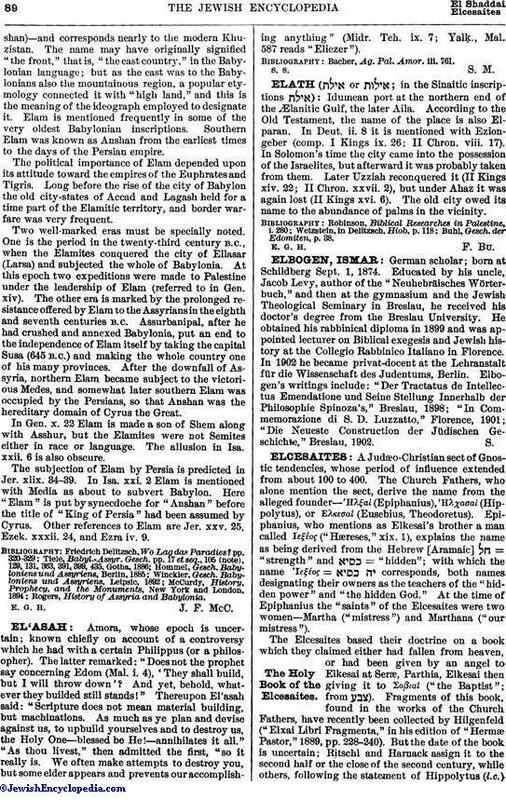 587 reads "Eliezer"). Bacher, Ag. Pal. Amor. iii. 761.